Nick spends his days building our customers’ computers. 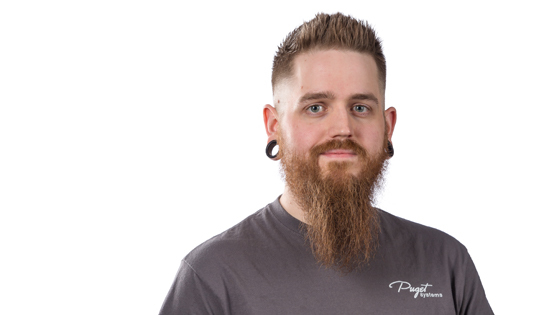 Prior to joining Puget Systems in 2016, Nick worked as an assistant warehouse manager and forklift operator for The Lincoln Electric Company. He decided to join the Puget Systems team because he was looking for something more mentally stimulating. He has a long background in personal enterprise hardware, building personal computers to be used as part of the distributed computing project, World Community Grid. The project uses spare computing power from personal devices around the world to help scientists identify the most important areas to study in the lab. Currently is one of the biggest HDD you can purchase. These drives are fast (for a mechanical drive) and quite reliable. The best way to utilize these drives would be in a multi drive RAID array as many of the features that you pay for in these drives would only benefit if you were running more than one. These are not the quietest drives but there really is no substitute when you need a massive storage drive that has a very reasonable cost per TB. This really is an amazing entry level GPU. The price/performance value is very good, it has super low power draw and because of that this 1050 ti requires no additional auxiliary power. This will handle most games at 1080p at a reasonable frame-rate while remaining quite quiet also at the same time this card would have no issue with productivity allowing the use of three (or more) monitors to be attached to the card. This drive is amazingly fast and runs way cooler than the 950 Pro it replaced. I upgraded to this for fun but the ability of this drive to run under normal conditions at quite cool temperatures really made me feel better about the long term viability of this drive. I have about 6TB worth of writes on this drive and it is still going strong. With the way these drives last and have VERY low failure rates I expect that this drive will be going strong for many years to come. I purchased this drive to replace my pair of 850 EVO 500GB (Raid0) that was used for my Steam drive. I have only had a good experience with this replacement. This drive is faster than my old Raid and the lack of failures we experience here comforts me that this drive will last for many many years to come. This server grade heatsink may not be the quietest option available on the market, but the tradeoff is a robust long lasting product that fits into our 3u rackmount server chassis. These have more than enough capacity to cool our Xeon offerings. The fan that comes with it is a long lasting dual ball bearing fan that is PWM controlled and allows the fan to slow down when the system is idle. When you are working with a small space and need to get that CPU cooled off the NH-L9i is for you. It is really one of the smallest heatsinks available, and does a great job. Due to the size of the heatsink it is not really recommended with high TDP (>100w) because there is only so much heat that can be dissipated with the physical constraints of the the form factor. Noctua does really make great products across the board, their fans last forever and they really go that extra mile to ensure their product lasts for many years to come. Did you ever want to fit 8 GPU into a 3u rackspace? Then this ESC8000 is for you, optimized for high density GPU horsepower. Can fit 8 of our high end GPU's and have a substantial amount of rendering power with redundant power supplies to make sure there is no hiccup in your workflow. This is a great sound card for people looking for just a little more pizzaz for their headphones without going with a dedicated headphone DAC/AMP. I loved this because it allowed me to use my Sennheiser headphones above the maxing out at whisper volume that onboard audio outputs are capable of doing. The ability to tune this with replacing the amp/op amp to better suit the type of headphone you use and style of music you deal with is a very welcome addition to consumer level PC audio equipment.